The Siege of 's-Hertogenbosch also known as the Siege of Bois-Le-Duc was an action in 1629, during the Eighty Years' War and the Anglo–Spanish War in which a Dutch and English army captured the city of 's-Hertogenbosch. The city had been loyal to the King of Spain since 1579 and was part of the Spanish Netherlands. Wesel is a city in North Rhine-Westphalia, Germany. It is the capital of the Wesel district. Delft is a city and municipality in the province of South Holland, Netherlands. It is located between Rotterdam, to the southeast, and The Hague, to the northwest. Together with them, it is part of both Rotterdam–The Hague metropolitan area and the Randstad. 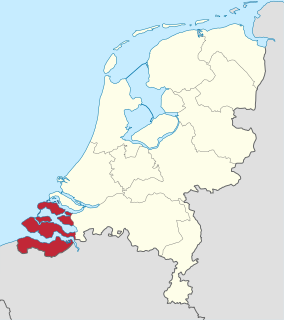 Zeeland is the westernmost and least populous province of the Netherlands. The province, located in the south-west of the country, consists of a number of islands and peninsulas and a strip bordering Belgium. Its capital is Middelburg. Its area is about 2,930 square kilometres (1,130 sq mi), of which almost 1,140 square kilometres (440 sq mi) is water, and it has a population of about 380,000. Overijssel is a province of the Netherlands located in the eastern part of the country. The province's name translates to "across the IJssel", from the perspective of the Episcopal principality of Utrecht by which it was held until 1528. The capital city of Overijssel is Zwolle and the largest city is Enschede. The province had a population of 1,142,360 in 2015. His widow commissioned an elaborate mausoleum in the Oranjezaal , a panoramic painted ballroom with scenes from his life and allegories of good government based on his achievements. Henry Casimir II of Nassau-Dietz was Stadtholder of Friesland and Groningen from 1664 till 1696. William Frederick, Count of Nassau-Dietz, Stadtholder of Friesland, Groningen and Drenthe. ↑ Poelhekke, J.J. (2008). "Hoofdstuk IX". Frederik Hendrik. Prins van Oranje. Een biografisch drieluik (in Dutch). Digitale Bibliotheek voor de Nederlandse Letteren. Retrieved 2008-08-07. This article incorporates text from a publication now in the public domain : Chisholm, Hugh, ed. (1911). "Frederick Henry" . Encyclopædia Britannica . 11 (11th ed.). Cambridge University Press. p. 62. 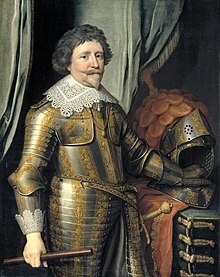 Wikimedia Commons has media related to Frederick Henry, Prince of Orange .